Thanks for sharing this news, Mike! thought you may be interested in the first dyno run for our new 904s Sports Big Bore Kit. On this dyno there are three runs showing, EFI 865 OEM, EFI 865 with TTP Stage 2 Power Induction Kit and 904s with Stage 2 kit. The bike was an 865 EFI Bonneville fitted with the TTP Stage 2 Power Induction Kit, Tune 12 & short free flowing silencers vs. the same bike with 904s Big Bore Kit installed with 904s Tune 12. 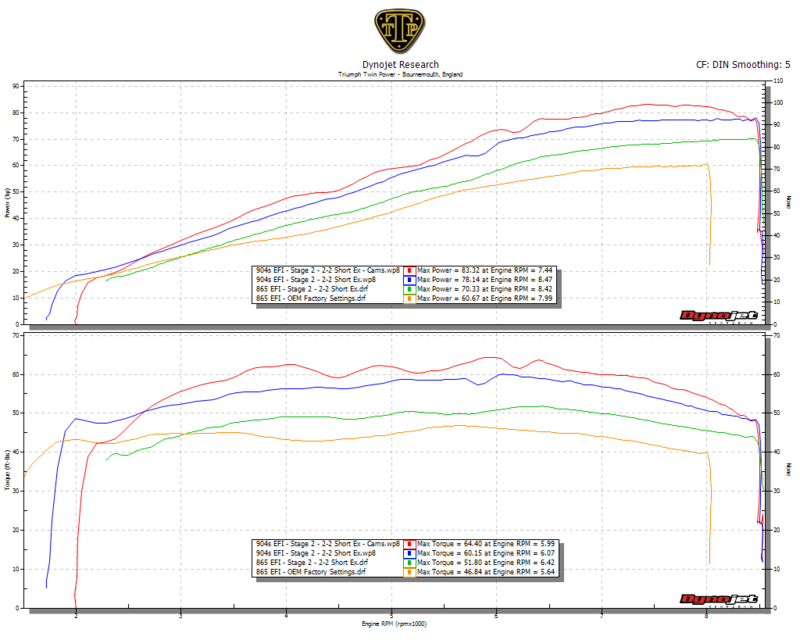 904s St2 vs. 865 St2 - Peak Power +12% (78.76 bhp), Peak Torque +18.1% (61.21 ftlb) & Max Torque Increase +20.5% @ 5,735 rpm. 904s St2 vs. 865 OEM - Peak Power +29.8%. Peak Torque +30.6% & Max Torque Increase 34.3% @ 4,173 rpm. We're really pleased with the results, not bad for an OEM engine using the 865 cams and 904 big bore. The bike pulls really well through the rev range, which isn't surprising as it has more mid range torque than our carb 904 with Stage 2 kit, 790 cams, less CR and Keihin FCR39's carbs. The carb bike had 4bhp more at the top end due to 790 cams and FCR39's.